Hey! 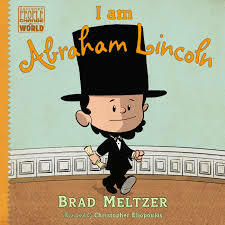 My first all-ages kids book in a while: Brad Meltzer and Christopher Eliopoulos’ I am Abraham Lincoln. I was torn about what this week’s theme should be, and then I realized…hey, this country is quickly imploding on itself, so let’s do something fun and inspiring! I know; I’m a downer right now. I try to keep my politics separate from this kind of stuff, but it gets hard. I get somewhat political on Twitter, but I used to be much worse. I’m working on it for my own sanity. I know that we are all shouting in the echo chamber of our bubble, but it feels good to let people know that you feel like they do. To let them know that you have their backs. I live in one of the greatest, most diverse cities in the world, Chicago, and if I want to shout support for my friends that might not look like me, heck, you know what, take offense if you want. I care for people. 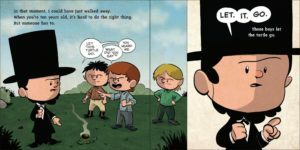 I believe that all people are created equal, and I follow the teachings of this little Abe Lincoln found in I am Lincoln. Look, I don’t know how much in this book is embellished. I know that a lot of it does come from places of fact and research. I actually went and researched a few things in the book when I was done reading it, and you should too, with your kids. Make a research day out of it! And whatever you find in your research, I’m sure that you’d be hard-pressed to state that Abe Lincoln did not stand up for his beliefs. He believed in justice, freedom, and having a voice. This book teaches kids that. And it reminds us older folk too! As an educator that has seen my fair share of kids being mistreated for being different, I refuse to let victimization of people that are different be a thing that just happens. I have refused, since before this past election, to stay ignorant and blind to what’s going on in our country. And I refuse to believe that helping others is a crime or weakness. I can’t believe how fired up this book has made me! I guess it inspired me to have a voice tonight, even if it’s a voice that might ruffle a few feathers. Without a few ruffled feathers every now and then, nothing would ever change. Buy this book, and use it to teach your kids what justice and standing up for themselves and each other is all about. People have been oppressive in this country for way too long! And as far as I see it, if I’m on the same side as Rep. John Lewis and his fight for social justice, 100 years after Abe Lincoln’s fights, I’m on the right side of history. And please there’s no need to go into a lost history of Abe Lincoln to prove how wrong I am. I like that this book inspired me in a positive way, and if it inspires kids to do things that are good and just, it’s great! If you get fired up about my “Liberal Beliefs,” I’d suggest you take the advice of Abe above and Let. It. Go. Also, I’d like to think that my beliefs are human beliefs, not liberal beliefs. I only want to make kids kind, loving, contributing members of this crazy society. I think we can all get behind that!